A new reading incentive program was launched in October. 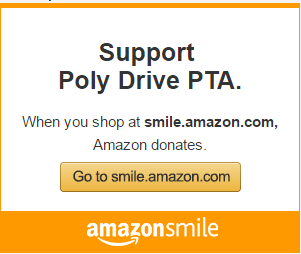 This program is supported by the Poly Drive PTA. READ-ATHON which will take place the end of January. WHY: Reading is so important for our youth. Our hope is that by hanging the reading incentive calendar on the fridge, on the door or the bathroom mirror, it will be a constant reminder to both parents and children to pick up a book and read! Making reading a habit pays off for students. Think about it this way–Student A reads 20 minutes a day, compared to Student B who reads 4 minutes or less a day. After one school year, Student A has read 3,600 minutes compared to 720 minutes for Student B. The information retained widens considerably over time, and most likely improves school performance! Now imagine the knowledge gained from reading just 20 minutes a day… year after year! GOAL: Read OR be read to 20 minutes/ night, record your minutes on the calendar… watch how quickly those minutes add up! At the end of the month turn in the calendar to your teacher and be entered for a chance to win one of many fun prizes!